Thank you from Key Ingredient! Our fundraising total for this weekend’s sale is now $12,765.15 and counting. Thank you to all the bloggers, volunteers, professional chefs, bakers, and business owners who made it possible for us to raise nearly $13K for the Central Texas Wildfire Fund this weekend. 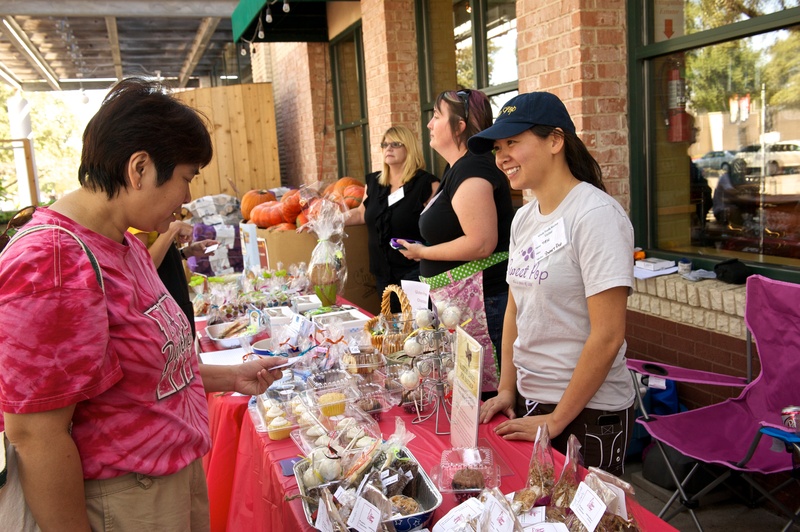 Volunteers at our seven bake sale sites raised over $10,000 for the Central Texas Wildfire Fund! Our gifts online and from business sponsors total nearly $12,500 and counting. Photo by Nathan Russell. We got a huge boost in our online fundraising thanks to Key Ingredient, an Austin-based startup company that helps home cooks share and keep their recipes online. Key Ingredient matched $1,000 of our online gifts, helping us leverage donor dollars and bringing awareness to the sale. Key Ingredient also donated aprons for our volunteers to wear and several dozen reusable grocery bags, so that customers who gave big could carry a lot of treats home. In addition to all of that, Key Ingredient has given us a Demy Digital Recipe Reader to give as a thank-you to one of the 100+ home bakers and volunteers who baked for Bastrop this weekend! The Demy is the first digital recipe reader that holds your entire recipe collection in a sleek, compact, kitchen-safe device. In addition to easy access to all of your favorite recipes, your Demy offers a high-resolution color touchscreen, a comprehensive list of common ingredient substitutions, measurement conversions, and three digital kitchen timers. Once you bring the Demy into your kitchen, you'll wonder how you ever lived without it. I selected a winner for the Demy by putting all our volunteers in a spreadsheet and using Random.org to draw a winner. Congratulations to Kathryn Lovett, our winner! Kathryn baked vegan brownies and vegan oatmeal cookies for the Whole Foods Gateway Location of the sale, and she worked as a volunteer on Saturday. Thank you, Kathryn, for your hard work this weekend!! Kathryn is pictured here with some of the other volunteers at the Whole Foods Gateway location of Austin Bakes. Congratulations, Kathryn on your new Demy! Photo by Kathryn Lovett. There are a few more recap posts from the sale coming soon, plus updates to our fundraising totals as gifts from Google Austin and Keeper Collection continue to accumulate. Thank you, Austin and Key Ingredient, for a successful sale! This entry was posted in Austin Bakes for Bastrop, Blog, News about the sale, Past Sales, Sponsors by Kathryn. Bookmark the permalink. Awesome! I am so jealous of Kathryn! I guess I’ll have to add the Demy to my Christmas list! Thank you so much! I can’t wait to receive the Demy. 🙂 I really enjoyed baking and volunteering. I had a great time. I am so glad that we raised so much money for such a good cause. Congrats Kathy! It was such a pleasure to volunteer with you and your husband – yay! I had so much amazing stuff from the bake sales. Those amazing savory scones from Whole Foods Lamar – yum! And then from Whole Foods Gateway the cupcakes with grapefruit glaze – holy cow! Thanks bakers!